This is a study of peasant-state relations and village politics as they have evolved in response to the state's attempts to control the division of the harvest and extract the state-defined surplus. 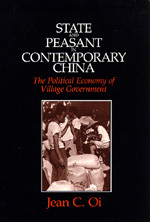 To provide the reader with a clearer sense of the evolution of peasant-state relations over almost a forty-year period and to highlight the dramatic changes that have taken place since 1978,1 have divided my analysis into two parts: Chapters 2 through 7 are on Maoist China, and chapters 8 and 9 are on post-Mao China. The first part examines the state's grain policies and patterns of local politics that emerged during the highly collectivized Maoist period, when the state closed free grain markets and established the system of unified purchase and sales (tonggou tongxiao). The second part describes the new methods for the production and division of the harvest after 1978, when the government decollectivized agriculture and abolished its unified procurement program. Jean C. Oi is the William Haas Professor in Chinese Politics in the department of political science and a senior fellow of the Freeman Spogli Institute for International Studies at Stanford University. Oi is the founding director of the China Program at the Walter H. Shorenstein Asia-Pacific Research Center. She leads Stanford's China Initiative, and is the Lee Shau Kee Director of the Stanford Center at Peking University. Oi directed Stanford's Center for East Asian Studies from 1998 to 2005.